Build extensive applications with cross-platform compatibility on the .Net platform. Our .Net Developers provide your business with comprehensive flexibility and scalability. Dedicated .Net developers at Clarion offer end-to-end .Net web development solutions that serve the needs of your business regardless of size, industry verticals or locations. Hire .net developers for both web & mobile based software development projects. We have the expertise to compose a digital face for all your business requirements. We have a reliable .Net support team which supports and enhances your running applications. Our team improves and deploys updated software versions at regular intervals. Clarion’s dedicated .Net development team helps you convert your existing services to .Net powered microservices. Streamline your production operations by exploiting Docker compatibility with .Net core. Hire .Net developers to get reliable modernization services. Our team analyzes your applications to create a detailed transition plan with recommendations to re-code, renew, re-platform, re-engineer, and re-architect your legacy system. Clarion has been in the front-end development business since 2000. When you select to work with our passionate .Net developers, you not only get an opportunity to interact with a highly efficient team but also enjoy ample benefits. We are ardent about serving clients in the best possible way and for the same we have a team of full-time .Net developers. Our expert in-house team of developers assure the timely delivery of any project. Clarion’s zero headache .NET development team is a pool of the best developers who are ready to take on your projects from the word go. They operate as your in-house employees and leave no stone unturned to deliver error-free code. Our developers can deliver web applications, product development, mobile games, e-commerce apps, dynamic website development, database management, project management, security and various other upcoming technological requirements. Our .NET developers use automation platforms to review the code. We use the latest CI/CD tools for faster, accurate and hindrance-free deployment. Clarion offers trustworthy .Net development services for a better ROI. Hire .Net developers who are passionate coders and have deep understanding of the industry. As a leading .Net development company, we make sure that you get innovative and tailor-made services. and above out of 5. We have certified developers in C#, VB.NET, ASP.NET, SharePoint, WPF, WCF, SQL Server . We inspire and train our .Net developers in affiliated technologies to expand their scope of work. way we have optimism for the future. Clarion has provided the most bug-free code I have ever seen. I have conducted a thorough code review and I continued to be amazed at how clean it is. It will be a joy to maintain in the future. Clarion Technologies is a dedicated company and they will work with a solutions attitude, thinking about how we can solve a problem. Clarion’s team brings both levels of professionalism and skill that has satisfied us beyond expectations. I would highly recommend Clarion. Clarion Technologies is a leading software development company providing top tech talent for foreward-looking small and medium enterprises. 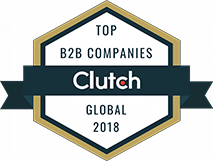 We’re thrilled to share that Carion has now been named as a 2018 Global leader in Software Development Segment by Clutch across multiple categories including mobile app developers (Android,iOS) and web & software developers (ReactNative, .NET, PHP, Ruby on Rails, AngularJS, Magento, Shopify, Wordpress, Drupal, AR/VR, Artificial Intelligence, Internet of Things, Blockchain, Chatbots).